Pro researcher recommends the best lure to fish offshore for marlin.. While the author maintained detailed logs over a 10-plus year span to determine the best lure for his waters, keep in mind that every area is different. The best way to figure out what lure runs best is to experiment with skirt combinations, spread location and hook-sets. Photo by Charlie Levine. Some lures get more time in the water than others, which can skew their ranking position. But the top performing lure for Steve Campbell is the Mold Craft Bobby Brown. "With 158 blues under its belt, Bobby deserves its place in the pattern," Campbell says. "I still run a selection of lures that have endured the passage of time. Some have given way to newer entrants and it is always interesting to see if the new boys on the block can cut the mustard." 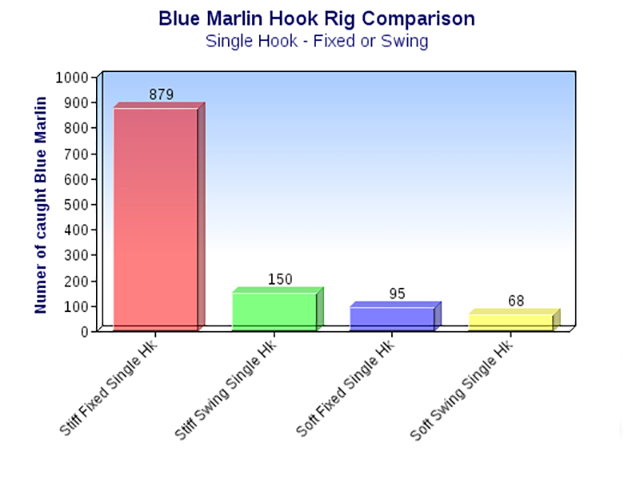 Of all cleanly hooked blue marlin, 87 percent were taken on the author's stiff-single fixed-hook rig. 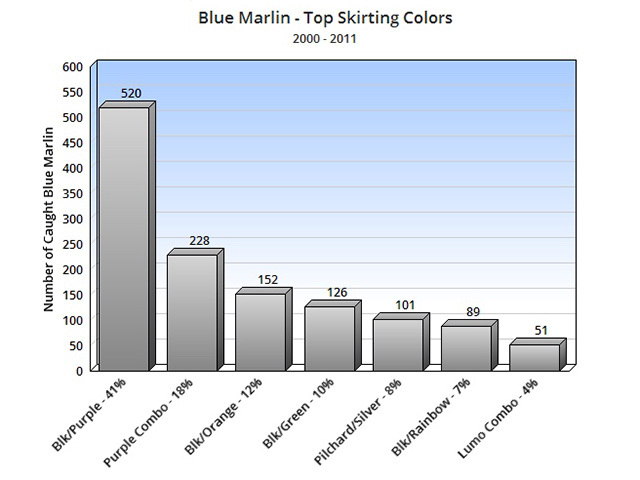 Purple skirt combinations accounted for 59 percent of the author's total catch of 1,267 blue marlin. Skipjack tuna are the dominant bait in Tonga waters, where the author fishes, and these skirting combinations reflect the prey-to-predator dynamics. 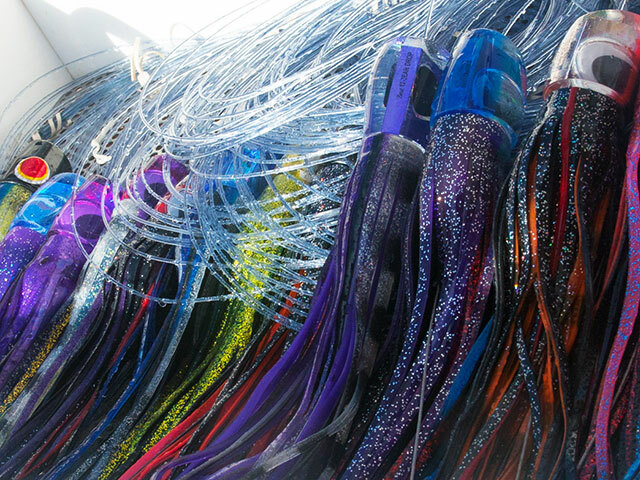 Most fishermen own more lures than they could ever use in a lifetime. However, we keep adding to the collection in hopes of finding that one magical lure that will outperform all others. Historically, science supported the notion that marlin don’t see color, yet certain colored lures and skirt combinations consistently caught most of our blue marlin. Fishermen were convinced that billfish did in fact have some level of color vision and, lo and behold, recent scientific evidence supplied by Dr. Kerstin Fritsches and others helped to establish the species does possess the right sort of eye hardware and structure to distinguish some level of color. Fish with the biological ability to distinguish color need light to see. At depths greater than 10 meters they can no longer distinguish color and have to rely on the ability to detect movement to hunt. 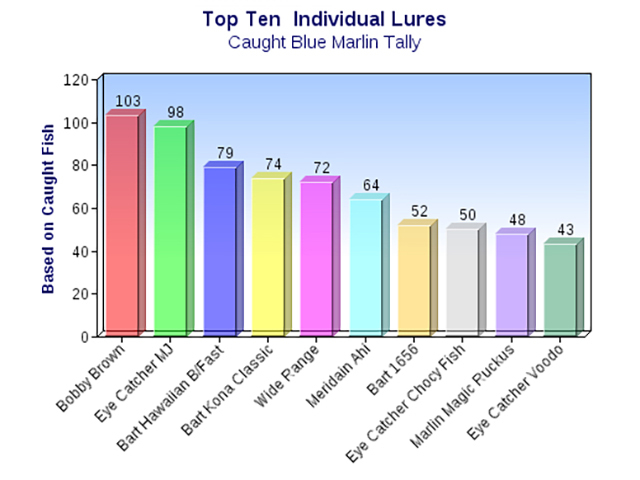 There is no doubt in my mind that you want your lure color to match the predominant prey that blue marlin feed on. In our waters it is skipjack tuna. When skipjack are hard to find the purple-black combo strike rates start to fall. If yellowfin are more plentiful we find black-over-green, fruit salad or green-over-gold skirting combinations do significantly better. All that one can conclude from the above observations is that color has an impact on blue marlin behavior. WHY DO SOME LURES WORK BETTER? The answer is not straightforward because we pull lures through the water amongst a set of diverse environmental variables including water clarity, tide, water temperature and sea conditions. Nothing is constant in the realm of offshore fishing and many things can and do change. Some days you can’t miss and they hit just about anything you throw at them while the very next day, the same lures may get absolutely snubbed. With 15 years of detailed capture data on blue marlin I can tell you exactly which lures caught fish, including lure head design, skirt color combination, the lure position in the spread, what hook-rig was used, where the fish was physically hooked, the GPS position, the depth contour and water temperature. I can then relate this back to tidal influence and moon phase. It may sound like overkill but what the data provided was the basis of establishing the ability to link sub-sets of information in an effort to fish smarter. Of the 1,267 blue marlin caught on lures between 2000 and 2011, 520 or 41 percent were caught on black-and-purple skirts. An additional 228 or 18 percent were caught on other purple skirt combinations. That represents a total of 59 percent of our catch. The vast majority of the lures were angle-faced and rigged with a stiff, single-hook rig. The fish were mouth-hooked which meant less dropped fish on strike and hook-up. The next piece of analysis showed the hot catch positions: 31 percent center rigger, 21 percent starboard long rigger, 10 percent starboard short corner, 25 percent port long rigger and 13 percent port long flat. A hookless teaser was run off the port side and achieved seven percent more caught fish than the starboard equivalent. I then looked at the catch rates directly related to which individual lures received the most strikes, which spread position and furthermore, what hook-sets had the best hook-up rates. So was it the skirt color alone, the actual lure or the position in the spread that raised the fish? I would have to say it's a combination of factors. Angle-faced lures have caught more blues than any other head design for my boat, even with skirting color combinations other than black-and-purple. I rigged other head designs such as a pusher, flat face and bullet head and none of hem matched the angled lure head. We ran the lures in the hottest spread positions and again the results didn’t show the consistency of angle-faced lures. However, if one or two lures are getting the majority of the strikes I never change the balance of the pattern because the other lures just might be the raising the fish. There seems to be a subtle difference between lures that raise fish and the ones that are clear catchers. We towed a fish-eye camera for two-plus years and we often witnessed a blue marlin coming up on one specific lure, stalking it, watching it and then for whatever reason racing over and striking another lure. I have no idea what this behavioral trait indicates but clearly certain lures must stimulate some predatory response. We recorded a small group of individual lures that were initial raisers by definition. We even put them in the hot-spot pattern positions to see if the pattern change converted them to catchers. We did get strikes on some of the lures but it was significantly below the standard pattern strike rates. Based on these examples, I believe there are raisers and catchers and I don’t change my pattern when one or two lures get most of the action. Unless you keep detailed records it is very hard to be objective about individual lure performance, especially if you are looking at specific time-band data sets. No matter what the results, it is always related to the actual time any one lure spends in the water. The lure that gets used the most generally gest the most bites. So one analysis I do looks at time trolled and compares it long term over many seasons right down to specific, season-by-season data. The trick is being able to cross reference the data to specific events or influences related to environmental and food web variables. If you haven’t recorded detailed and ongoing data the task is near impossible. 1. The surface bait species: I always investigate to see what bait and associated bird activity is present. Scan varying water depth to establish if there is deeper set bait activity. 2. My selected lure pattern at the beginning of the day may need fine-tuning based on the above observations. I do not run duplicate head and skirting combinations in my pattern. I believe in running a banquet spread, with something for blues of every size. 3. I work the area hard usually within the parameters of the current influence and historical catch contour depth. 4. I don’t change my selected lure pattern unless new observations dictate a change. 5. I record general observations regardless of fishing success or otherwise. Like any fishing trip you have good and bad days on the water. The learning curve just never stops. Usually well into any given fishing season you become more intuitive and by the end of the season you are feeling pretty pleased with yourself. Next season comes around and it’s back to the drawing board. Only a few of those top performing lures are consistently catching fish. As frustrating as it maybe that’s what makes fishing a challenge. There will be certain lures that just keep performing year after year as others disappear into a lure dog box and new stars appear. My all-time top-performing individual lure is the Bobby Brown Senior by Mold Craft. As of the end of the 2015 season it had accounted for 158 blue marlin. I run this lure on the port long rigger and as a teaser for the bait-and-switch. It is a raiser and a catcher, and a faithful friend. It doesn’t handle my stiff-single-fixed-hook rig and runs best with a 10/0 Mustad hook. Just because the Bobby Brown is our best performer, doesn’t mean it will be yours. It takes a lot of time experimenting to develop consistent success for your boat and your waters. The strike-to-catch-rate ratio is a good measure of performance and I can honestly say our single-stiff fixed-hook rig was the difference for us in achieving a consistent 80 percent blue marlin catch rate. To read more of the author's blue marlin observations, check out his book, "Blue Marlin Magic," available at Wild River Press.